A Cornwall-based environmental pressure group has backed plans for a wave farm off the South West coast. Members of Surfers Against Sewage (SAS) gathered in Hayle on Monday to promote the renewable energy scheme. Sited about 10 miles (16km) out to sea off St Ives Bay, the Wave Hub could generate electricity for 14,000 homes and create about 700 jobs by 2020. The project is supported by the South West Regional Development Agency, but still needs the government's consent. The agency has spent £500,000 on a study into whether the Wave Hub is viable, where it would be best located and the economic benefits of the project to the South West. Last year researchers said the height of waves and the strength of currents off the north Cornish coast had huge potential for generating electricity. 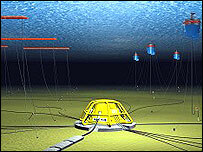 The £15m Wave Hub would act as an offshore electrical "socket" connected to the national grid by an underwater cable. It is hoped to have the hub in place by 2007.